Crawley Town's Reece Grego-Cox. Picture by Steve Robards. Crawley Town forward Reece Grego-Cox missed out on taking home the Republic of Ireland Men's Under-21s Player of the Year Award at the '3' FAI International Awards ceremony in Dublin on Sunday. The Reds' striker was nominated alongside Portsmouth winger Ronan Curtis, the winner of the award, and Liverpool defender Corey Whelan. The 22-year-old has made eleven appearances for the Irish under-21s since debuting in 2015 and scored all four of his international goals in the Republic's failed attempt to qualify for the 2019 UEFA European Under-21 Championships. 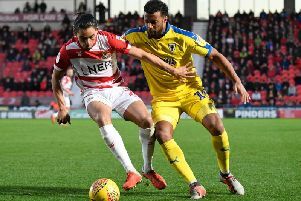 The former Woking player, who is now ineligible to represent the under-21s, is now aiming to cement his place in Gabriele Cioffi's team and catch the eye of Ireland senior manager Mick McCarthy.